Oh, I just love new release previews! First up we have Holiday Anya #4. There's a theme here, just wait. 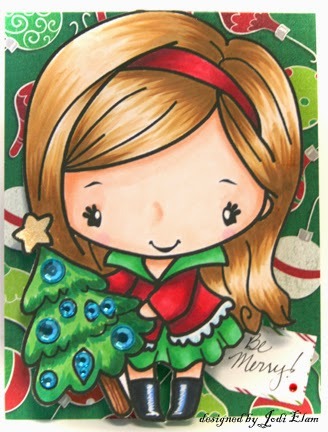 I worked with the digi version and made her A2 sized (ah the advantages of a digi) and colored her with my Copics. Now she's super-sized cute! Wanna win Holiday Anya? Make sure you visit all the gorgeous creations done by the other members of the design team and make sure you leave some lovin'. You have until 11:45 tonight and you could be the winner! Great great artwork! A2 size, wow, that's a lot ot coloring work. Super cute card. Love the super sized Anya on your card. She is soo cute..and clever idea to change the size!! Someone is getting into the Christmas spirit early this year, love your card TFS! They are all so cute! I love seeing the versatility! She's just adorable! esta hermosa Jodi, coloreaste hermoso este sello y el cabello me encanta te felicito!!! Love this one! Great coloring! I like your super sized Anya! Super-sized cuteness indeed! I love how you blinged up her cute little Christmas tree! This adorable image has catapulted up to the top of my TGF wishlist for sure! So sweet, love your coloring and her cute outfit! So cute! love the there are blue lights and a little nose =) I am curious about digital stamps...rumor has it that using markers the cutting machines can draw out a digi stamp! cery cool! Makes me want to learn to work with Digis! I love this! Wow! Love that it is a digi as I didn't even realize the difference until you mentioned it. Beautiful! Just amazing. You did a beautiful job. Love this Jodi!!! Love the gems on the Christmas tree! This is Awesome and I love her sooo much!!! She's a doll! Love the coloring! Ohh!! I love how your colored her. Great shading!! Ahhh the bling on the tree! Love it!